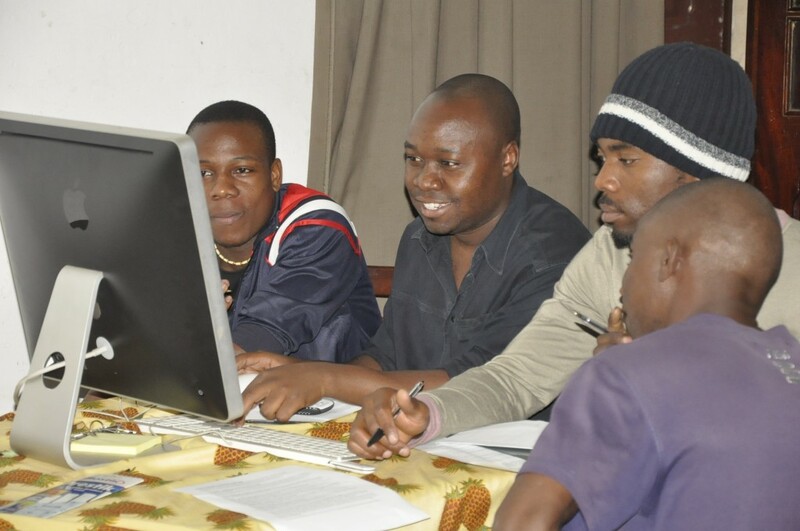 This is the second of two posts reporting on a Citizen Media and Free Culture [pt] workshop that took place at the National Journalists Union in Maputo, Mozambique in July 2012 as a volunteer project implemented by the author of this post, Sara Moreira, and Júlio do Carmo Gomes. The idea that writing down a thought helps one think better and deeper, and that sharing it with others, as bloggers do, often forces one to examine their thoughts more critically and honestly. Rising Voices’ introductory guide to citizen media describes some of the benefits from blogging in this way, and the motto served as a starting point for the 3-day workshop's practical sessions. The open nature of blogging platforms, which allows broader outreach to those who share the same interests – in contrast to more closed platforms as Facebook, which can often allow access to content only to “friends” – was also considered as an advantage in helping to choose blogging as a practical tool for the workshop. The maintenance and nurturing of a good blog requires a strong will to feed it and a commitment to quality, which were some of the points emphasized during the workshop. A set of tools and tips from RV's Blogging Guide (partly translated and adapted for this workshop) was compiled for the participants, as well as Tactical Tech's checklist for effective blogging. The collective mapping exercise allowed for working groups to identify and explore social issues for possible subjects of the collective blogs. Why collective? It is a way to reinforce, via practical work, the importance of the collection of diverse critical and independent perspectives about the reality and the world. And as a consequence of this horizontal sharing of information, there are many more possibilities that arise because of this collective decision-making. Among the issues addressed in the blogs that were created ranged from gender issues (the Swiluva blog, a word that means “flowers” in the local xichangana language), languages Cultura Pela Língua (Culture by Language), which intends to promote artistic creations and cultural demonstrations in the dozens of languages in Mozambique), security issues (Policiando a Polícia, (Policing the Police) in the search of solution against police repression in Mozambique, transportation A Realidade dos Chapas, (The Reality of Chapas) [local buses], intended to report on the daily life of transportation, exposing the precarious conditions under which Mozambicans travel), and Trazparencia (Transparency), with the aim to analyze the country's governance and economic development. The blogs created in the practical sessions are no longer active, but the creation process that was followed served as an introductory experience for other activities to come. The platform used was WordPress, and basic technical issues, such as the creation of hyperlinks, meta-information, posts, tags, categories, comments, identities, etc, ended up taking longer than expected in the time available for the workshops. Specific content examples were suggested and illustrated for each blog, such as types of interviews, guest authors, external referrals, humour situations, video-reports, and photo-of-the-day. Almost two months have passed since the completion of the Free Culture and Citizen Media Workshop, and as a result, new blogs have blossomed in Mozambique's online panorama. From one of the creators of the extinct Cultura Pela Língua blog, @Verdade's newspaper Culture Editor, Inocêncio Albino, comes up with the blog Espólio, “a parallel program of journalism practice” whose aim is to publish articles on Arts and Culture, inviting communication students, ordinary citizens, journalists, and artists who want to promote their creations to submit their contributions. Não se trata (…) de um lugar onde encontrarão tratados científicos ou verdades que se pretendem absolutas. Hão-de encontrar, quando vierem, um cidadão comum. Um cidadão que, muitas vezes, andas apinhados nos chapas deste país, um cidadão que frequenta os mercados deste país, um cidadão que almoça em barracas e faz compras nos Xipamanines da vida. Em suma: um autêntico moçambicano. It is not (…) a place where you will find scientific treaties or truths that claim to be absolute. When you visit, you will find just an ordinary citizen. A citizen who is often squeezed in while riding the local buses of this country, a citizen who goes to the markets of this country, a citizen who has lunch in barracks, and goes shopping in “Xipamanines” of life. In summary: an authentic Mozambican. III – Conscientizar o cidadão sobre a potencialidade dos meios e formas culturais, particularmente a arte, para expressão e defesa das sua idéias e visões no referente à vida no país, sobretudo à realidade que o circunda. III – Raise awareness among citizens about the potential of cultural means and ways, particularly the arts, and for the expression and defense of one's ideas and visions regarding life in the country, above all about each person's surrounding reality. There is also David Nhassengo's (@pentchicodc) blog Pentchico Dmbuza Capetine, whose weekly chronicle Estado de Graça (State of Grace) and its focus on music and is well worth an upgrade to a podcast. It has already attracted a lot attention through his followers on Facebook. In the closing session, all participants were invited to reflect on what would be taken from the workshop — “an incentive for us all”, said Orlando, “I only hope there will be continuity (…) I want to film more and take more photos”. A oficina mostrou-me a importância de expressarmo-nos mais como jornalistas com liberdade. The workshop showed me the importance of expressing ourselves more as free journalists. Com as oficinas percebi a importância de usar as redes sociais para expôr o que nos preocupa, os problemas sociais e como um instrumento crítico e não só para entretenimento e coisas banais. With the workshop, I understood the importance of using social networks to expose what worries us, the social problems, and as a critical instrument for use in not only ordinary things. Despertamos para o real impacto das redes sociais e a importância que têm para divulgar aquilo que não vem na média oficial. Percebi que através dos blog e Facebook pode vir a tona um assunto que parecia não ser relevante. Agora é preciso explorar mais a realidade moçambicana em que poucas pessoas têm acesso às ferramentas. Uma coisa é a grande cidade, outra coisa é a vida real. We have woken up to the real impact of social networks and the importance they have for spreading what is not seen in the official media. I understood that through blogs and Facebook, a subject that did not seem relevant may come out. Now we need to explore more of the Mozambican reality where only a few people have access to tools. One thing is the city, another thing is real life. É preciso ultrapassar o mistério do medo. Num país democrático deve haver liberdade de expressão. One must surpass the mystery of fear. In a democratic country there must be freedom of expression. Teríamos de falar mais sobre o que é a cultura livre. É preciso quebrar o medo, acabar com a ideia de que “ser governado é ser explorado”. O povo moçambicano é mamparra, está habituado a sofrer no silêncio. Temos de mudar isso. We should have spoken more about what is free culture. One must break away from the fear, put an end to the idea that “being ruled is being exploited.” The Mozambican people are “mamparra” (stagnant), and are used to suffer in silence. We have to change that.